Helen is the incumbent Membership Coordinator and her moving to the role of Team Coordinator means the post was to be left vacant. But thankfully, Mariane Lingley stepped up and agreed to take over matters of membership for the remaining term. The new CCC members join Simon Arnott (Music Director and Music Coordinator), Liss Macklin (Secretary) and Charl Asuit (Fundraising Coordinator) for the 2016-17 term. In the photo above, from left to right: Lan O’Connor, Simon Arnott, Helen Walledge, Liss Macklin, Mariane Lingley, Hayley Nock, Sarah Palframan, Charl Asuit, Adeline Giacometti, Daisy Blench. Fresh off the back of the sell-out dress rehearsal, members of London City Singers (LCS) made their way to Newcastle, excited to perform in The Sage. Many of us were able to head up in time to enjoy the quartet competition on Friday and were treated to another high quality contest. This was a great way to start a weekend of singing, as well as a fantastic learning experience for members, especially the first timers. We were all excited to hear the results and congratulate the winners The MIX (International Division) and Oops! (Open Division). Several of our members were involved in the new social media initiative with Region 31 Management Team to promote interest for new members to join Sweet Adelines International and support the new webcast for Region 31. We’d certainly encourage more of this next year: it was fun, rewarding, and a great way to meet other members in the region. Finally, it was the day we’d been waiting for! We had a relaxed morning getting ready, warmed up and energised. What’s a Saturday morning without lots of hairspray, false eyelashes, line dancing and even some tears anyway?! Once we had provided ample entertainment for the rest of the hotel guests eating breakfast, it was time to polish our makeup and get “blushed” by Linda. Sequins finally in place, we were ready to head to The Sage. Even though there was a slight delay with the contest proceedings, a relaxed LCS were patiently waiting to join the traffic pattern. We knew our plan and were going to deliver! Stepping out on stage was as exciting as ever– whether at contest, weddings, tube stations, anywhere! LCS loves to perform. We had a great time sharing our package and walked off confident that everyone did their job. What more can you ask? The chorus was excited to watch the remaining contestants. With some of the larger choruses performing you really get a sense of sound on stage. We even got to wave on the webcast for our supporters at home. Then drum roll, the results. Well, it turned out to be a disappointing outcome for us. Big congratulations, though, to champions Forth Valley with a record breaking regional score. We can’t wait to see them take the stage in Vegas in 2017. The weekend wasn’t over yet though. Members of LCS proved why we are together – we love singing. We entertained several groups in our hotel prior to dinner (they didn’t want us to leave!) then had a fantastic time singing in our own afterglow hub. But since the tenors went to bed, other members took their turns at filling in, with varied results. Sunday was activity packed, with three of our members performing as part of the Young Women in Harmony chorus. So, after a busy morning of education and even more singing, convention was drawn to a close with another rousing performance of How We Sang Today, the Sweet Adelines International anthem. So how do we sum up our collective learnings from convention 2016? We LOVE singing, we can deliver our plan for any song, we know how to entertain, Simon’s costume needs more sequins, we follow commands well (“wave!”), we have improved our sound year on year. If all that wasn’t enough, this is a fabulous group of people who know how to enjoy what they are doing and have FUN! Check our Twitter and (brand new!) Instagram feeds for more photos from the Newcastle 2016 Convention. We’ll post the video of our performance on stage soon. The prospect of singing regularly and working towards a goal (like convention) were some things that made Emma (pictured in the middle) join London City Singers. She joins our bass section already with the knowledge of barbershop and experience of a Sweet Adelines convention. After university, I completed a TEFL qualification and began teaching English as a foreign language to international students in central London. I absolutely loved it as I met such interesting people from all over the world. The teaching bug took hold and I wanted to pursue my own foreign languages which I studied at university (French and Italian) so I decided to do a PGCE in secondary languages. A year and a bit later, and I’ve almost finished (or should I say ‘survived’?!) my first year of teaching in a secondary school in Hertfordshire! To escape from my mounds of work, I enjoy baking and (of course) singing! I have always enjoyed being part of some kind of singing ensemble, from chamber choir and musicals at school to barbershop choruses and quartets at university, to female a cappella during my PGCE. Since moving back to London from Cambridge last year where I rehearsed 2-3 times a week, I really missed singing regularly and was searching for choirs in London when a friend (and another new chorus member) told me she was going to the LCS taster session. It looked and sounded like the kind of thing I would like and so we went along together. From the taster session I found that I really liked the variety of music that the chorus sang, it was fun and yet challenging; everyone was keen to work really hard to create the best sound possible while enjoying it along the way. I was excited at the prospect of having singing regularly in my life again and also to work towards the goal of performing at convention. Everyone was very warm and welcoming and so I decided to go back the following week. I love singing a cappella and I think barbershop style arrangements are often a really fun and technically interesting way to do so. Having competed a few years ago in the Sweet Adelines convention as part of a quartet, I know what a wonderfully mad world the world of barbershop is and am excited to be part of that again. Emma (pictured, with green top) sang barbershop in uni and was missing it. 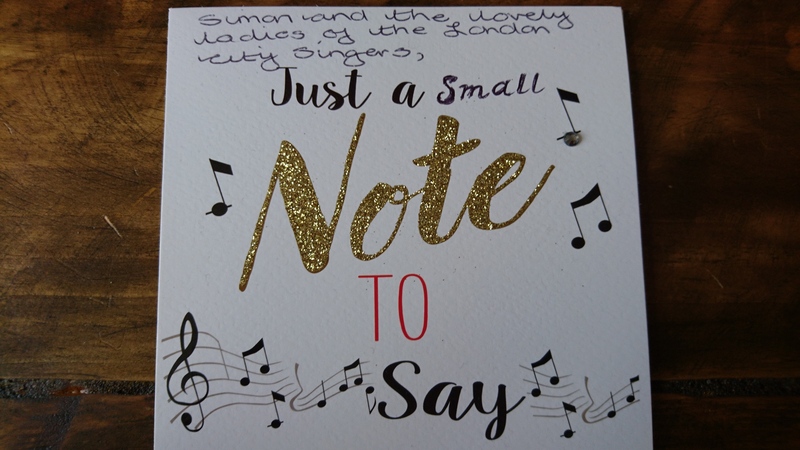 After attending London City Singer’s Taster Tuesday session, she found a group that she could sing barbershop with on a regular basis. Read the story of the newest member of our baritone section below. I’m a Music Teacher in primary schools and enjoy teaching children from 3-11 years old. I’ve recently moved to London from Bristol and changed role from class teacher, covering all subjects, to specialising in Music. 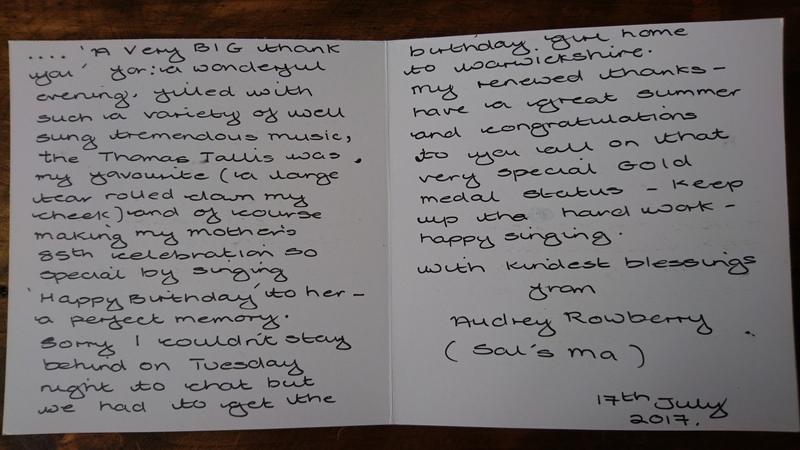 This has proved really fun and I do a lot of singing in a typical day – but I was keen to join a singing group outside of work and sing something other than children’s repertoire! Throughout university I sang in various groups with a barbershop society and developed a love for a cappella singing. Through fellow singer friends advice, I had seen videos of the chorus online and then looked up their website. I thought the group looked really friendly and sang a fun range of songs. Luckily, there was a taster evening coming up soon! I really enjoyed the taster evening and was excited by the sound and the journey the chorus seemed to be taking. The evening was fun but we also focused on technical aspects of singing so I felt I could learn a lot from the chorus. I also wanted to be part of a singing group with regular rehearsals and goals (such as convention) so I had dedicated time to enjoy singing and meet new people. The chorus were really relaxed and friendly, which made me keen to go back. What are your thoughts on singing barbershop? I enjoyed singing barbershop in uni and have missed it since! I think singing a cappella is a great challenge and really satisfying when the sound comes together. I also like that there is a yearly convention to work towards and always a friendly atmosphere. London City Singers goes on a retreat weekend each year, usually around spring, to prepare and focus on our contest package for convention. For our 2016 retreat, baritone section leader Katherine sums up the weekend. We’ve recently returned from our annual retreat, a residential weekend packed with singing and fun aimed to focus our energies on our upcoming convention performance. Last year I was a newbie at retreat, having passed my audition at the start of the same week. The retreat was a wonderful way to get to know the chorus, as well as learning barbershop basics like coning while I tried to wrap my head around the mysteries of something called ‘convention’. I remember us videoing a pyjama-party cut of our uptune and trying to sing every song the chorus had ever learnt as we walked back to our accommodation block in the middle of the night. A year later, we were back at the same venue, and I suddenly felt like an old hand as I helped out with warm-ups. Once again I grappled with ‘convention’, this time trying to sum up the experience for another generation of new members. Once warmed up, we were joined by our coach, Nicky Salt (now coming all the way from France) and our new director, Simon Arnott. In the collective psyche of the chorus, this meeting of coach and director felt like the first time you invite two different groups of friends to the same party. We love them both but what would they make of each other? We needn’t have wasted a minute on this idle speculation. They were immediately united by their ambition for us as a chorus, their appreciation for our chorus personality, and their flair for creating an entertaining performance. Two days well spent and well rewarded—including another memorable Saturday evening, this time testing our knowledge of pop, rap and rock lyrics, eating kilos of sugar, and watching Pitch Perfect 2. It was impossible to capture everything we learned in a single page, but we brought some real changes back home. We changed our weekly warm-ups so that we’re unifying our sound right at the start of every rehearsal. Working on our ballad has unlocked the emotion of the song for us, connecting us with the magic of the lyrics. As for our uptune, well… we can’t wait to share it with our region at convention in a few weeks. We hope our friends in Region 31 enjoy the performance as much as we do.